“It is important to recognize that AD begins in the brain prior to clinically apparent symptoms. This preclinical phase may be our best opportunity for successful treatment in AD,” said Reisa Sperling, MD, of Harvard Medical School, Brigham and Women’s Hospital, and Massachusetts General Hospital in Boston. “The study demonstrated that groups identified as preclinical AD tended to decline more, compared to those without evidence of elevated amyloid, over the next three years,” said Donohue. The ADCS-PACC is primarily intended as a tool to track cognitive decline during preclinical AD and is heavily weighted towards episodic memory – the type of short-term memory that is affected very early in AD. In order to uncover preclinical markers, researchers are attempting to identify subgroups of individuals thought to be at increased risk for AD. “The interesting thing is that all seven of the risk factors we looked at are really very weak risk factors. For each of them, the risk of AD is increased by only 50% to 80%, so they really just shift a person’s risk slightly. The key factor that is driving these estimates is how common the risk factors are in society,” said Barnes. Making small changes at a societal level could potentially have a huge impact. If 10% fewer people had these seven risk factors, Barnes and colleagues estimated that about 8,800 fewer people would develop AD by the year 2050. A 20% reduction in these risk factors would result in an estimated 16,000 fewer cases by 2050. 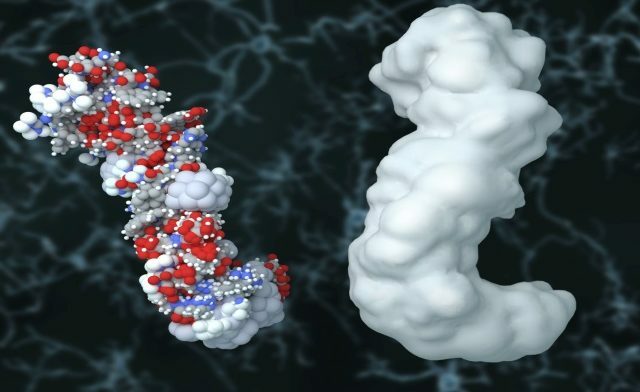 Because AD has been characterized by the presence of amyloid-beta plaques, anti-amyloid treatments are a main focus of research targets for the primary prevention of disease. However, the data raised the hypothesis that solanezumab could work for patients with mild AD or patients at an earlier stage in their disease process. There are additional ongoing studies evaluating this drug in mild patients and as a preventive strategy. Solanezumab is just one of several monoclonal antibodies being studied to prevent or treat AD. “Any intervention that could prevent cases, or even delay the onset for as little as ten years, would greatly reduce the prevalence of this disease. We are hopeful that this sort of anti-amyloid approach will begin a new era in the treatment of Alzheimer’s-related brain disease,” Doody said. Beth Gilbert is a freelance health and science writer. She has an undergraduate degree in chemical engineering from Lehigh University and a Master’s in biomedical engineering from Columbia University. Donohue MC, Sperling RA, Salmon DP, et al. The preclinical Alzheimer cognitive composite: measuring amyloid-related decline. JAMA Neurol. 2014;71(8):961-70. Norton S, Matthews FE, Barnes DE, Yaffe K, Brayne C. Potential for primary prevention of Alzheimer’s disease: an analysis of population-based data. Lancet Neurol. 2014;13(8):788-94. Doody RS, Thomas RG, Farlow M, et al. Phase 3 trials of solanezumab for mild-to-moderate Alzheimer’s disease. N Engl J Med. 2014;370(4):311-21. Clinical trial of solanezumab for older individuals who may be at risk for memory loss. Clinicaltrials.gov. Available here: https://clinicaltrials.gov/ct2/show/NCT02008357. All electronic documents accessed Dec. 15, 2015.